It looks like The Conjuring movies are becoming a bit of a family affair. The Nun, the upcoming spin-off of the popular horror franchise, has just added Taissa Farmiga, the younger sister of The Conjuring and The Conjuring 2 star Vera Farmiga, to the cast in a lead role. The movie is currently filming and she is the second lead actor announced for the movie, alongside Hateful Eight star Demián Bichir. The news comes courtesy of Deadline, who are reporting that Taissa Farmiga, who is best known for her work on FX's American Horror Story, has joined The Nun and will be playing, somewhat appropriately, a young nun in the upcoming horror flick. James Wan, who directed both of The Conjuring movies and is producing The Nun, responded to the news on Twitter, welcoming Taissa Farmiga to the production and joking about the family link that now exists in the franchise. Here is what he had to say. "Welcome @taissafarmiga to the family! Goal is to work with all the Farmigas. 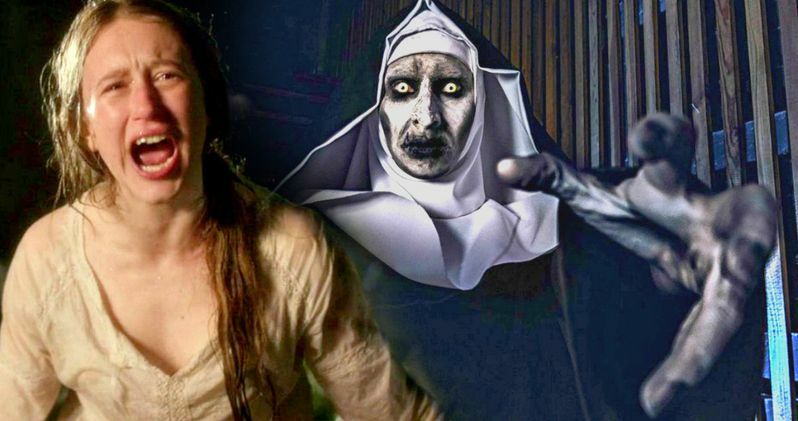 @VeraFarmiga #TheNun #talentedsiblings"
Plot details are being kept under wraps for The Nun so far, but we do know that the movie is going to be centered on the creepy nun Valek from The Conjuring 2 which, interestingly enough, was a last-minute addition to the movie. Since Vera Farmiga was the one who interacted the most with Valek, it will be interesting to see if she winds up having any tie with Taissa Farmiga once The Nun is released. Since the movie is already filming and the cast is growing, we will probably learn more about the movie in terms of story in the relatively near future. Warner Bros. is trying to develop something of a horror movie cinematic universe with The Conjuring movies, which The Nun will help expand. Annabelle, which was the first spin-off based on The Conjuring, did very well at the box office but was not embraced by critics and fans in the same way that the main Conjuring movies were. However, the early buzz on Annabelle 2 has been good and with Lights Out director David F. Sandberg at the helm, it looks like the studio has done a good bit of course-correcting after that first misstep. They can't risk putting out another subpar movie if they want to keep this franchise going and they seem to understand that. The Nun is slated for a prime summer release on July 13, 2018, That is a strategy that worked very well in the past for The Conjuring movies, as well as last summer's Lights Out, so they have every reason to think it will work for this movie as well. Before The Nun hits theaters, we will be seeing Annabelle: Creation on August 11. Warner Bros. also has plans for The Conjuring 3, but there is no release date set for that movie yet. The Nun is being directed by Corin Hardy (The Hallow) with a script from Gary Dauberman and James Wan.